Hans does not care for guacamole or pico de gallo. As I like both, it is nice to cook make it whenever we have dinner guests. 1. Use about one tablespoon of refried beans and spread in the center of one tortilla. 2. Sprinkle beans with shredded cheese. 3. Tug the sides of the tortilla in and roll the tortilla. 4. Place in oven-safe glass dish. It is best to spread a little bit of enchilada sauce on the bottom of the glass dish to prevent sticking. Layer the rolled tortilla with the seam down into the glass dish. 5. 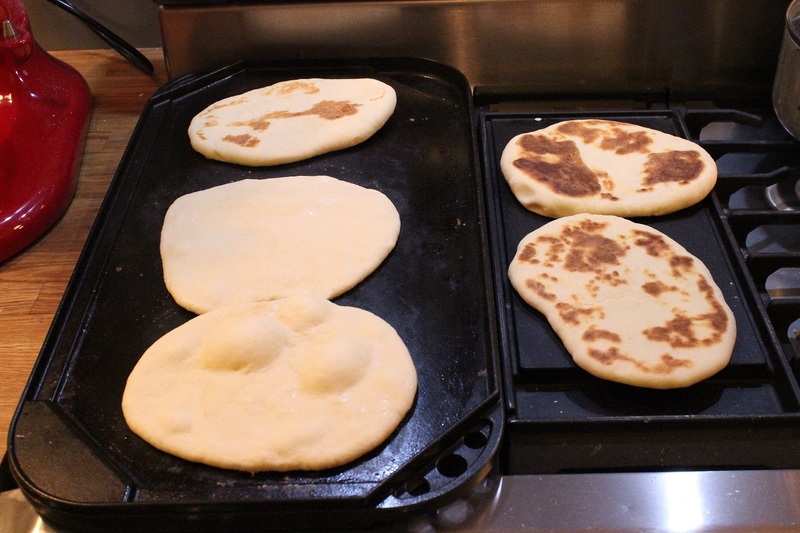 Repeat steps 1-4 for the remaining tortillas. 6. Pour enchilada sauce over the rolled up tortillas. It maybe helpful to use a knife to gently lift each one and allow sauce to go in between each. Sprinkle with cheese on top. 6. Preheat oven to 350 F. Bake for 30 minutes. 1. Rinse the rice under running water. This will remove the starch and make the rice very fluffy. 2. Heat oil in dutch oven on stove. Check for the temperature of the olive oil by dropping a couple kernels of rice into the dutch oven. If they start to sauté right away, the temperature of the oil is at the correct temperature. When the correct temperature has been reached, add the rice to the dutch oven. Stir frequently and sauté the rice until it appears translucent. 3. Add the water, salsa, and veggie bouillon cube. Heat until simmering while stirring constantly. Once the mixture is simmering, turn off the stove. Move the dutch oven into the oven at 350 F. Cook rice for 30 minutes. Stir once at 15 minutes. 1. Heat olive oil in small pot. Once oil is hot, sauté onion until translucent. 2. Add beans, sautéed onion, and green chilies into blender. Blend until smooth. 3. Transfer bean mixture back into small pot. Heat slowly. Add taco seasoning to taste. 3. Add in the following: tomatoes, onions, jalapeños, and cilantro. 4. Squeeze some lemon juice into it, and mix. 5. Add in cumin powder, salt, and black pepper. Mix well. 6. Chill and serve as a dip with some chips. 1. Combine the ingredients. Be sure to taste the pico de gallo. If necessary adjust the seasoning by adding more salt or additional diced jalapeno pepper. 1. Heat plates briefly in oven. 2. Arrange enchiladas, rice, beans, guacamole, and pico de gallo. Sprinkle with Coteja cheese and serve with sour cream (optional). Categories: In The Kitchen, Main dishes | Tags: enchiladas, guacamole, home-made, Mexican rice, pico de gallo, refried beans, vegetarian | Permalink. Everybody has a comfort food. 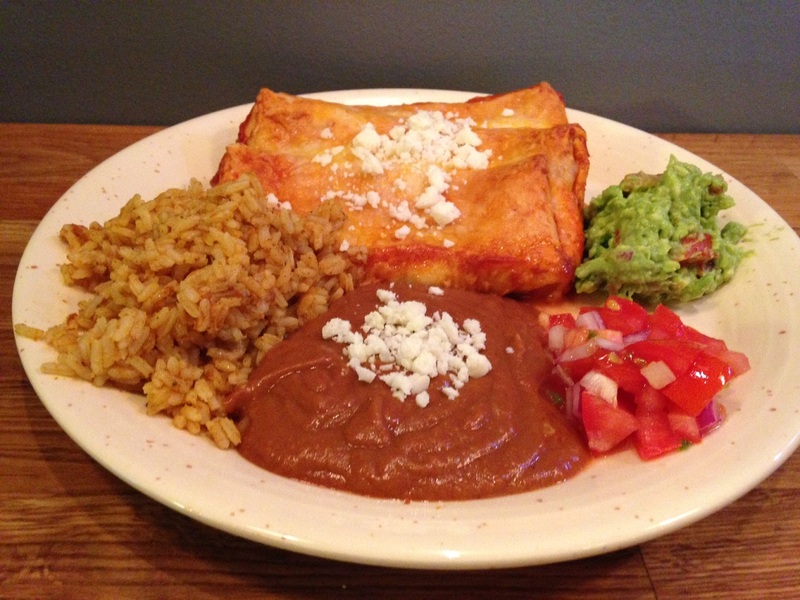 Our comfort food is homemade cheese & bean enchiladas. Not just the enchiladas but the whole meal as served in a Mexican restaurant. 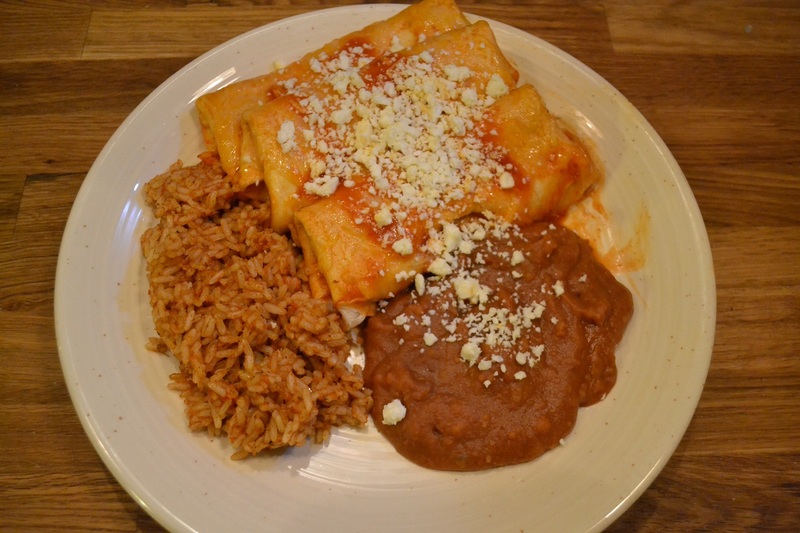 For a week night dinner this dish includes: cheese and bean enchiladas, refried beans, and Mexican rice served with Coteja cheese. 2. Arrange enchiladas, rice, and beans. Sprinkle with Coteja cheese. Categories: In The Kitchen, Main dishes | Tags: Coteja cheese, enchiladas, home-made, Mexican rice, refried beans, rice, salsa, vegetarian | Permalink. Strawberries are ready to be picked out of the garden! And while I enjoy stuffing my face with hot, sun baked strawberries right off the plant; they are pretty good in ice cream too! Add everything but strawberries to a pot and simmer on low on the stove. This will make a custard. Cook it until it coats the back of a spoon and then remove from heat. Lay plastic wrap on the surface of the custard to keep a skin from forming and place in fridge. Once cooled, pull the plastic off and pour in a traditional ice cream machine/freezer. Add strawberries to the machine in whatever form you chose and follow the traditional instructions for use. 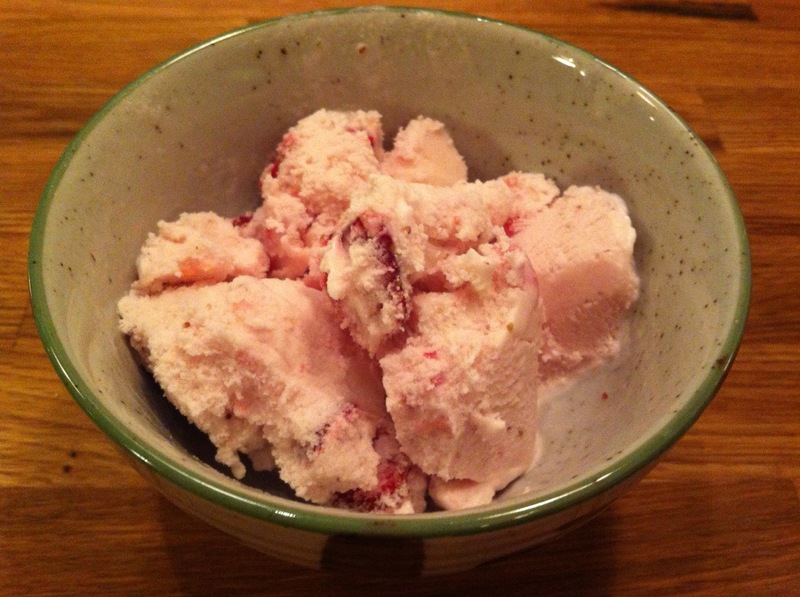 * While this may not the healthiest of recipes, it is healthier and yummier than store-bought strawberry ice cream. Most store-bought ice creams will contain corn syrup, molasses, and likely other ingredients such as xanthan gum. * Another benefit are the organic strawberries. Strawberries are rich in vitamin C, which helps the body absorb iron and maintains healthy skin, teeth, and bones. Vitamin C also serves as antioxidant that strengthens the immune systme and helps fight infection. Categories: Cookies & Treats | Tags: home-made, ice cream, strawberry, SUMMER | Permalink.